Penguins are birds which, during their evolution, have forgotten to fly. They're not the only birds, because emus, nandus, the well-known ostriches and coursers such as kiwis and wekas, and the flightless cormorants of the Galapagos too, aren't able to fly too. Flying birds have extremely light bones, tubular and hollow, which decreases the weight of a bird, necessary for a good flight. Moreover they have an ingenious system of air sacs, built in to other parts of the body, so the streamlined form, needed to decrease the friction, is maintained. But this has his limits : the more weight, the harder the flight will be, so the limit for a possible flight lays around 15 kg. The heavier a bird is, the longer the "runway" should be. Based on this principle, ostriches evolved to coursers and penguins, although they waddle in a comic way, learned to fly in the water. Although flying has its advantages by the search for food or the escape from predators, the loss of aviation can also have some benefits. 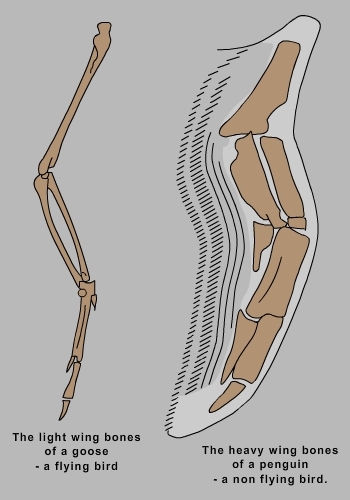 To come back to the osseous system: the bones of a penguin aren't filled with air and extremely light, but heavy and filled with marrow. Moreover the system of air sacs partly had to make way for a very large stomach, so they can take up food till 1/3 of their body-weight. This is necessary if you consider the fact that sometimes a penguin (as f.e. the emperor) has to walk days to reach their colony and therefore really needs these reserves. This results to the fact that a penguin, in opposite to f.e. a swan, don't float on the water but for the greater part is under water, with only his head and back above it. 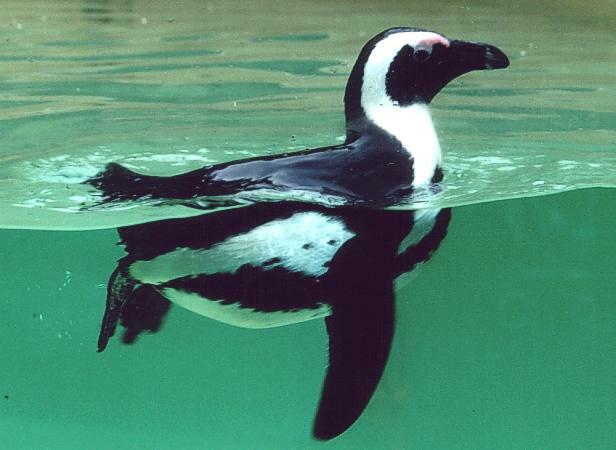 Advantage of this: a penguin can dive very deeply, impossible for other birds, and still has no problems surfacing again with the help of the air sacs. Other characteristics too can be explained by their lives in the water. Flying birds need upwards forces under their wings and tail to be able to start and land. These wings and tail need to be horizontally, while the legs must be vertical to the ground to be able to carry their weight by starting or catching it by landing. Therefore their legs must be placed in the middle of their body, and because these are used as "paddles" too. But on a penguin the streamlined form has increased a lot, while their legs are placed far more backwards. They don't need the paddles anymore as propulsion but only use them as a kind of elevator, with the short tail as an vertical rudder. They don't have to land but simply stand up when leaving the water. Especially the sight of rockhoppers, jumping as swift as an arrow out-of-the-water and upright landing on a rock or ice floe is very spectacular. On that way, their wings evolved to "under-water" flippers. These are short and small, covered with short but elastic feathers which improved their ability to "fly in the water". Penguins don't need to fly anymore to catch their food and can therefor dive much deeper (emperors till about 500m depth and the little blues down to 30m) and much longer too as any other flying seabird. On that way they can catch fish on places without concurrence from other birds. next chapter: why penguins don't live on the Northern hemisphere?